You’ll notice (if you notice these things) that my post has gone up somewhat earlier than usual. That’s because this week I’m participating in a rather awesome event through one of my publishers – Booktrope. 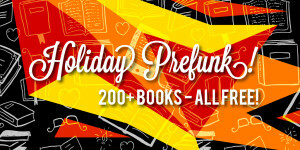 The event is called the Holiday Prefunk and it’s quite simple but kind of cool. Details as follows. It began on Monday November 9 (sorry I’m coming in here a little late) and will continue till November 14. During the event, heaps of books (over 200) from the Booktrope catalogue will be available for free. That includes my two novels, Magnus Opum (comic epic fantasy – Tolkien with a twist) and A Fate Worse than Death (comic detective fantasy – really, you need to read it to find out). So (as a great Australian used to say) do yourself a favour and check out all the great books on offer. And if you’re feeling so inclined, do me a favour and check out my books too.